Last week I got a phone call from Cass Duffy, from the Borough of Collingswood. She called to ask me if I'd be able/interested in doing an interview with a writer from Inquirer, regarding my experience with the Collingswood Pop Up Gala. Now, when have I ever shied away from talking or any sort of publicity? Me? NEVER! Of course I said, and a few minutes later, Rita Giordano, a writer for the South Jersey Section of the Philadelphia Inquirer called me. We had a very pleasant conversation, talking about how lovely Collingswood is, the benefits of living in a hip small town and still having quick access to Philadelphia. We discussed the ways the Pop Up Gala is like a little version of Diner en Blanc, and of course, we discussed my involvement with that event. The next day, the article was published and I received a few mentions from friends on Facebook, which was nice. But then, the negatives started to pile up on that bastion of social media. I won't dwell on them, since the negatives weren't about me, more about the idea of these events, the money it costs to do them, and all of the hard work that goes into the event; it's a common perception that I frequently see and hear. The usual complaints (not ones uttered by anyone I personally know) are that why would anyone pay money to go to an event where you have to bring all of your own stuff (tables, chairs, food, etc.) and then dress in all white, follow a set of restrictive rules, and then schlep to some unknown location. I've read comments online that call participants in these parties, "douches" and idiots. I've read about people countering the event with a protest dinner called Diner et Noir. Some folks even try to crash the event wearing bright colours, to mess up the "look". And I've read things where people are outraged that any of this costs money. Oye. 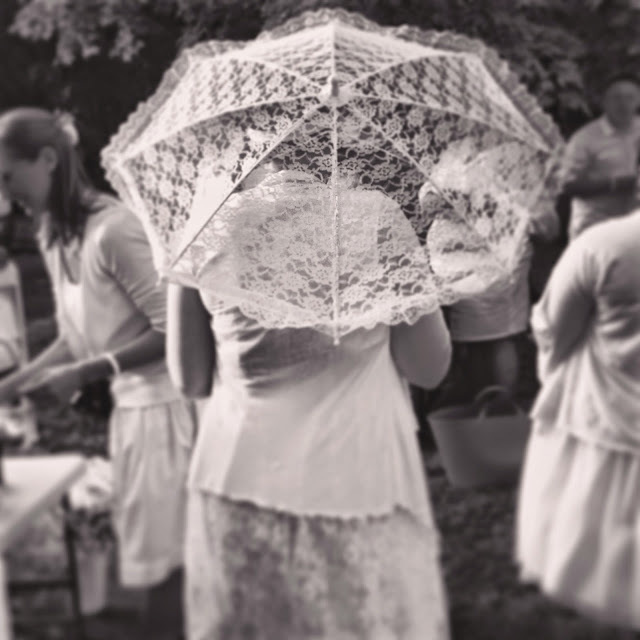 Since I am so involved with Diner en Blanc Philadelphia, and because I adore theme events, I'm quite happy to follow along with the rules that come go with this party. I'm glad I can afford to do this sort of stuff. Believe me, it wasn't that long ago when I couldn't afford to cross the street, let alone schlep a table, chairs, and an entire dinner to go dine with a few thousand people somewhere on a city street. I get that it's a frivolous endeavor. I get that it's not for the faint of heart. It's a lot of work, especially for the first time you do it. The outlay of money is daunting. 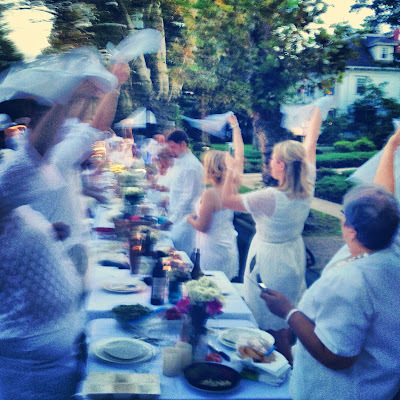 I'd say it's a once in a life-time event, but seeing that I'm now on my third Diner en Blanc and second Pop Up Gala, it's a yearly occurrence in my life. I'm lucky to be able to afford to do them, with time and funds, and a lot of white accessories! So for those out there that don't "get" these events, please don't knock them. It's fine that you don't want to do them, or cannot afford this sort of expense. 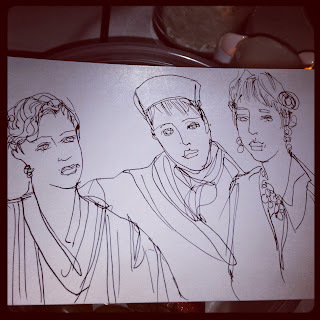 I just don't want to be bullied because I can and want to attend an elegant affair. I don't want to read that you are going to go and do a grey themed party because wearing all white one (or two) night(s) a year is stupid. Stupid is making fun of something because you don't want to participate, for whatever reason. Stupid is not seeing the big picture that events like these bring together a community, bring a positive focus to an area and bring a little bit of magic to life. With so many negative things happening in our world right now, isn't nice to have a reason to celebrate with friends for one night? Collingswood, that little hub of hipster cool in Camden County, is holding its second annual Pop Up Gala on Sept. 6. Inspired by Dîners en Blanc, which began in Paris 1988 and spread to cities around the world, including Philadelphia, the gala is expected to attract hundreds of revelers, dressed all in white and toting all they need for an elegant D.I.Y. dinner. They will report to appointed locations in town on the night of the event. From there, they will be led on foot to a top-secret site where they will dine and dance the night away. "The best thing was watching everyone walking there," said Mayor Jim Maley. "It's very visual. It looks awesome." Maley got the idea from listening to friends talk about a Dîner en Blanc event in Philadelphia. "I said, 'We can do that. We can do our own,' " Maley said. 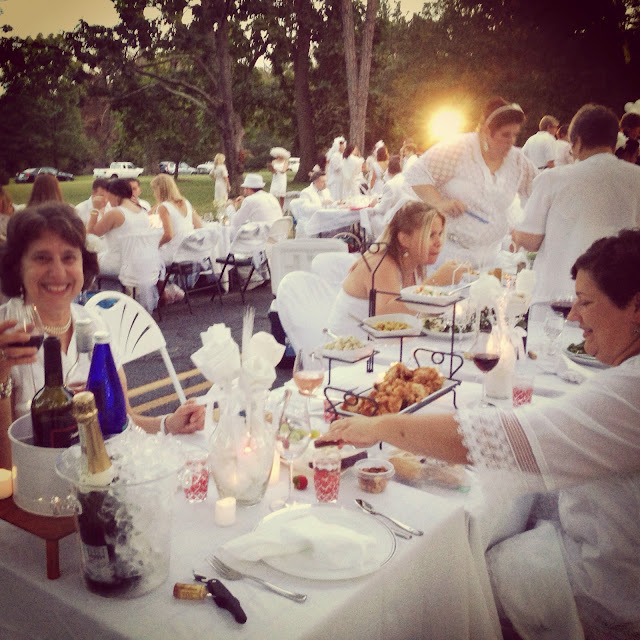 Like Dîners en Blanc, the gala has rules - some of them quirky. They're just part of the charm. "Creative elegance is encouraged," say the guidelines. Tickets are sold only in pairs; you can't go alone, although groups can sit together. When you get your tickets, you will not be told which location you will report to. That information is conveyed on the day of the event. Team leaders will be at the various sites to lead the groups to the final destination - and even the leaders won't know where that is until they get a text telling them to get moving. Attendees must dress all in white and bring their own table and chairs, a white tablecloth, nondisposable china, flatware and glasses, and dinner and beverage, including champagne or wine. Some type of candlelight centerpiece is also required, with faux candlelight allowed. Live music and a DJ are provided by the town. At the end of the night, guests pack up their gear and tidy up the site, leaving it as they found it. Town officials were struck by the level of enthusiasm the gala generated. "Once people dived into the concept, they really got into it," said Cass Duffey, Collingswood's communications director. 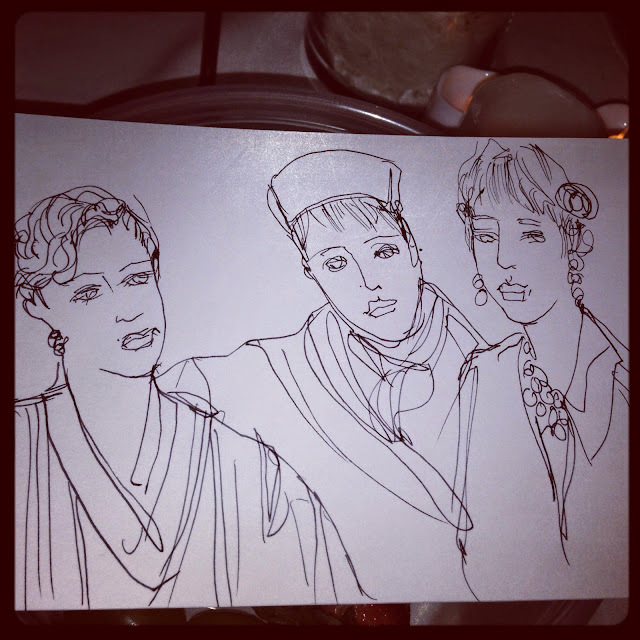 People came with big hats, fabulous candelabras, white gloves, white tuxedos. One party even painted a child's wagon white to cart its stuff. Another had an elaborate s'mores-making setup. Last year's gala, held on Browning Road near Knight Park, drew about 240 people, but town officials are expecting more this year. For one thing, South Jersey magazine recently named the gala its "Best Dining Experience" of the year - "South Jersey's own Midnight in Paris." For another, people who went last year have announced they are coming again - and they're bringing more people. Denine Gorniak, a bookkeeper and cooking teacher who moved three years ago from Philadelphia to Collingswood, said she was shooting for a party of 10, up from last year's four. 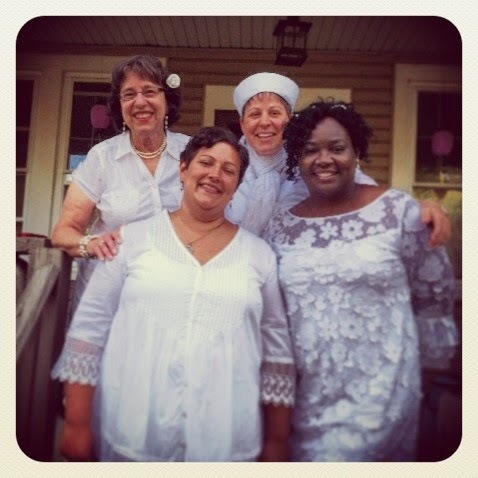 She has been to two Dîners en Blanc in Philadelphia and will be a table leader at the one coming up Aug. 21. The Dîners en Blanc are "magnificent," she said, but the gala has a special place in her heart. "I love it, love it," Gorniak said. 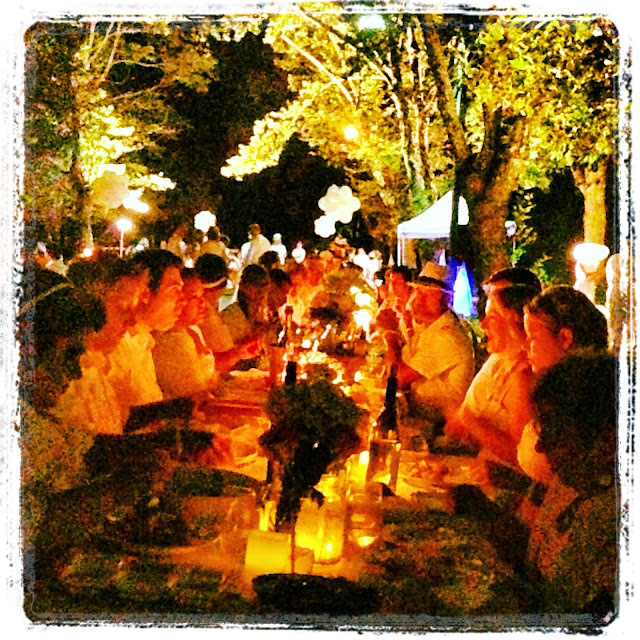 "I have to tell you, I had a better time at the Collingwood event than at Dîner en Blanc. It was more intimate. It was a real coming-together of people and the town. I knew the people." The Philadelphia events are exciting and larger scale, with more of a competitive spirit, she said, whereas the gala has more of the traits that have turned her into a Collingswood fan. "I think there's something charming about the Collingswood event," said Gorniak, who also has a food blog. "Dîner en Blanc is magical. It's like a movie come to life. The Collingswood event is sweet." Tickets for the gala are on sale for $40 a pair before Aug. 18. From Aug. 18 to Sept. 5, they are $50 a pair. Maley said the money from last year's event covered the borough's costs in putting it on, with maybe a little left over. But the gala isn't intended to be a fund-raiser, he said. "It's just a fun night." Haters gotta hate. That's cause they are incapable of coherent thought or generosity of spirit. It does take a creative, ambitious person to do these types of events. If you weren't lending me a hand in most of it for Diner en Blanc, and hadn't offered me a seat at last year's Pop Up, I would never get to experience these types of festivities, both due to cost and preparation. And I have to admit, once at both will be just enough for me. But I do think people should admire the commitment involved.